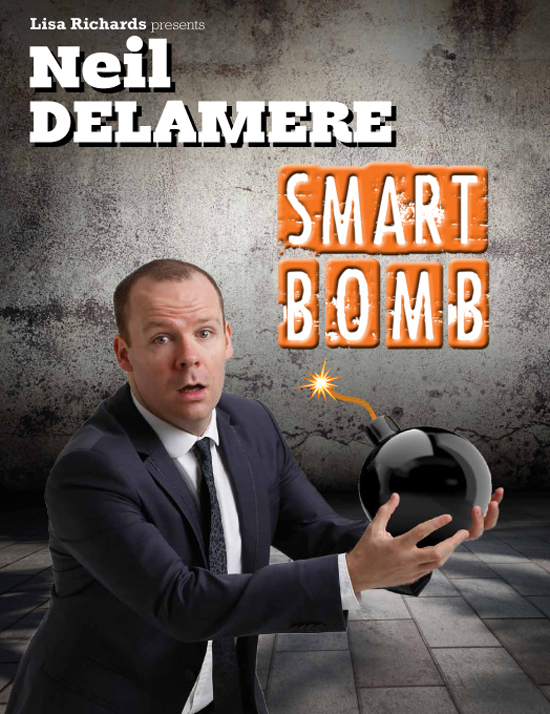 Down Arts Centre is bracing itself for the imminent arrival of one of Ireland’s funniest men – comedian Neil Delamere will bring his brilliantly funny new show, Smartbomb to DAC on Sunday 2 March at 8pm. Following his sold-out tour last year, Neil Delamere makes his debut appearance at Down Arts Centre with his brilliant new show. Smartbomb sees the star of BBC’s The Blame Game and Fighting Talk and RTE’s The Panel explain Ireland’s recession, eye patches and email viruses. Probably not in that order. Neil has performed all over Ireland as well as at the prestigious International comedy festivals in Kilkenny, Melbourne, Montreal and New Zealand. In 2007 Neil returned to Montreal to perform in the Just for Laughs Festival whilst also presenting the RTE television series covering the event, Neil Delamere’s Just for Laughs, for the second year in a row. In 2008, Neil’s Edinburgh Fringe Festival show attracted rave 5-star reviews and lead to an appearance on Michael McIntyre’s Comedy Roadshow on BBC1. Most recently, There’s Something About Patrick, a programme presented by Neil and filmed in part in Downpatrick, has been nominated for a Celtic Media Award. ‘There’s Something About Patrick’ sees the comedian travel the length and breadth of Ireland to meet experts, historians and Saint Patrick’s Day revellers to discover the truth about our Patron Saint. Not content to just separate the truth about Patrick from the myth, Neil physically gets to grips with life in Ireland during Patrick’s time by wrangling snakes and climbing Croagh Patrick barefoot. Perhap’s Neil will share some of these experiences with his audience at DAC on 2 March! Tickets £15 / £12 concession. Suitable for age 18+. Places are also still available for Repeat Pattern Print Workshop on Saturday 22 March and Heat Transfer Print Workshop on Saturday 29 March. Both workshops run from 10am – 4pm and cost £40 / £35 concession, including lunch and materials.